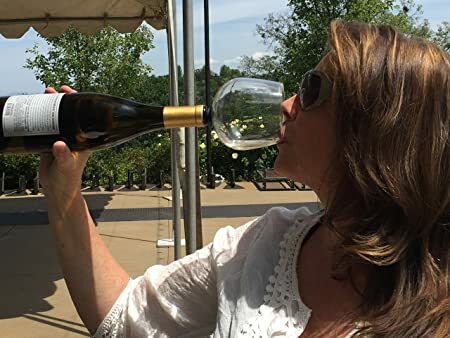 Guzzle Buddy Wine Bottle to Glass Converter! This is the Original Guzzle Buddy wine bottle glass as featured on Ellen, Live with Kelly, Facebook and numerous viral social media videos. Beware of counterfeits, knockoffs and cheap imitations sold by other companies. It is the perfect gift for any occasion like weddings, gifts for bridesmaids and groomsman, bachelorette parties, birthdays, housewarming and even a girls night out Bachelor viewing party. Or… maybe it’s just for you because you’re just to lazy to get off the sofa to pour another glass. The Guzzle Buddy fits in most bottles like red and white wine, beer, soda, and hard cider. The silicone sleeve provides a tight seal, with no spills or mess. If you can drink from a cup, you can drink from the Guzzle Buddy. It has a wide diameter rolled rim for comfortable drinking and it’s freezer safe to -20 Celsius or -4 Fahrenheit. With a size of 480ml it’s your go to extra large wine glass. Click “Add-To-Cart” today and we will ship your Guzzle Buddy in a cool retro brown protective gift box and we offer a 30 day money back guarantee. International shipping available.